I hope everyone had a great weekend and Mother’s Day! We have been busy around the house and planning a summer vacation! In a bit we will be visiting my hubby’s parents in PA so that will be a nice change in scenery. We are thinking of going to Tybee Beach and seeing Savannah!I love the history, the Southern Charm and of course, a new natural beach to go to. It has been pretty cloudy and rainy this week, but that doesn’t stop me from wearing some of my favorite trending looks. Today I am wearing an off the shoulder lemon top and a pair of new espadrille gladiator sandals from Franco Sarto. Fruity fashions are on trend right now, from watermellon epadrilles and handbags to fruit themed tops and dresses. Yes, a second week of white jeans! These are my favorite, as they are a light material and have a bit of a distressed look. I do find myself wearing more white jeans than regular denim especially this time of year. I’ve gone a bit shoe obsessed lately with a few dressy pair of sandals and several casual pairs. These lace up the leg and I love olive, so they were a winner! 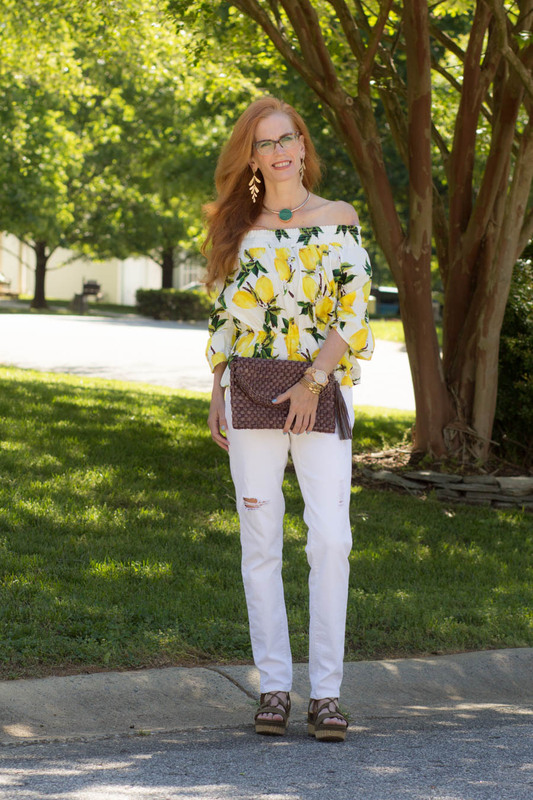 The off the shoulder top I found last year at Shein, and can be worn on or off the shoulder. If you did wear it on the shoulder, the length then I would have to wear high rise jeans as the length obviously shortens. I have other similar shopping options below. This necklace I found on Poshmark from Zara. It caught my eye by the design and color. Im waiting on a natural straw clutch from Mango, but in the meantime, this one gets used quite often! What is it about fruity tops or accessories we like in the summer? Maybe because all of the fresh fruit is in season? This top reminds me of summer-drinking lemonade on the porch, or making lemoncello 🙂 Maybe it reminds you of fruity cocktails by the pool? Whatever the case, there is alot of Fruity Fashion around! Are you a fan of Fun Fruity Fashion? (say that 5 times fast! hehe) What attracts you to it? Time for Turning Heads Tuesday! As Always, please follow me on a social media forum, if you don’t already. I appreciate it, as your host. Linkup any beauty, fashion, lifestyle or IG post. Tell your friends ! 🙂 Have fun ladies!! Check out my post from yesterday on Coastal Sunglasses if you haven’t already. Readers get a 35% discount until May 31! I’ll be wearing them all summer. Most Clicked this week: Love the colors in this outfit by Cherie of Style Nudge. Pinterest Pic: Love Ashley of Le Stylo Rouge white sweater, cute white flats and light denim. What a beautiful top Jess.I have a dress in this print but I need to lose a few pounds to get back into it. You have inspired me to get back into it now 🙂 Thanks for joining us at Creative Mondays. So gorgeous!! I love the top! You look so precious in this top Jess! I love the style and the colors for you. This top is really pretty, I also like the sandals. Love the lemon print blouse and white jeans Jess. You look amazing. Love the necklace too! I’m loving the lemon print lately! Especially that I live in California so it’s rather appropriate to wear it, haha! Love this bright, sunny look! Your new olive espadrilles are so fabulous and look comfy, too. 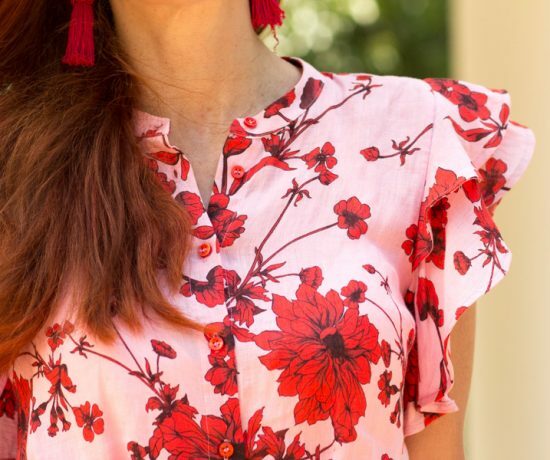 What a fun, vibrant top for spring! Is there something more summery than fruit prints? OK, maybe flower prints.o) Beautiful and juicy top. Looks great on you with white distressed jeans. That top is fab on you Jess! Great colours and loads of fun with the bold lemon print. Loving the yellow lemon top. It is such a refreshing look Jess – Makes me want a glass of cold lemonade!! And, the over the shoulder look is fab. Thank you so much for the feature!! Love your beautiful, bright top. 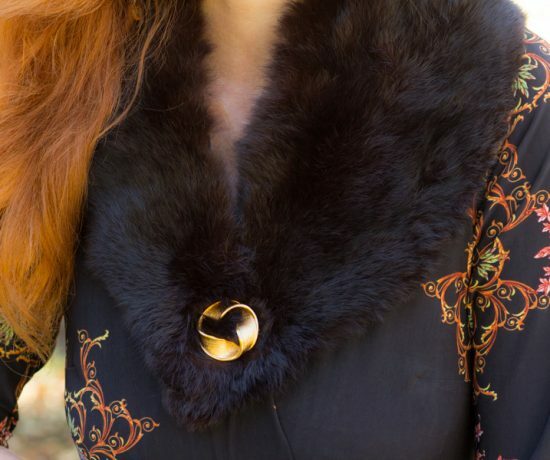 It looks lovely on you! I love this print and have actually been searching for another top in this print. Love how it’s cinched at the waist! What a fun summer OTS top! Love! Such a pretty top! You look amazing! These lemon prints are really nice. They seem to be a perennial that comes back every now and then. They really scream summer. I love how you styled this piece. I love fruity fashion…I tend to be drawn towards pineapples and cherries! Such a cute top! Love the entire outfit. What a fun top!! and the accessories you have chosen totally complete the look … those espadrilles look tres chic yet comfy!! Love this top!! The color and pattern are so fun! Jess, this is such a lovely outfit! I have been wanting to add some yellow to my closet and this top would be soooo perfect! Peace! 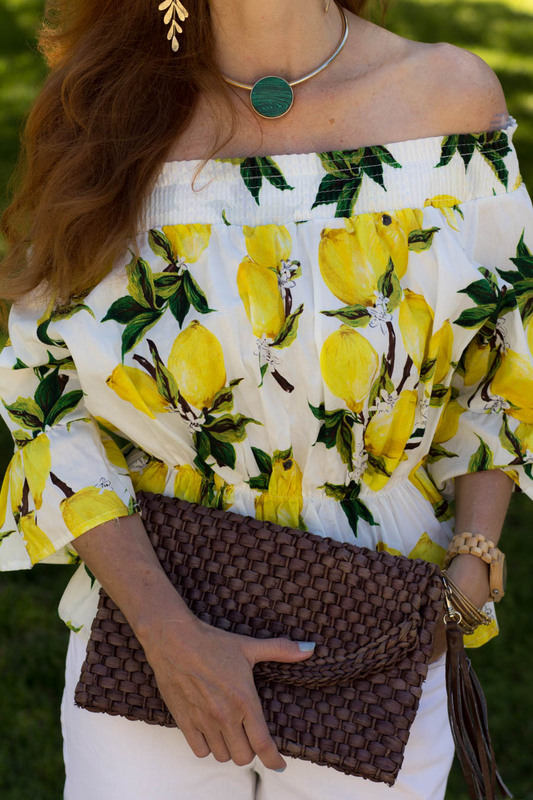 That lemon print top is absolutely lovely! I just adore the fun print! Such a fun print, and I love it with your espadrilles! Fruit is fun! 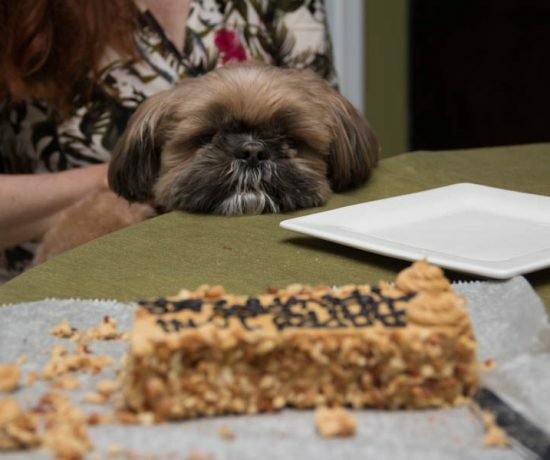 You look delicious! I love love love the lemons, so refreshing! Paired with white jeans is a fabulous summer outfit! I have watermelon pants and we’re enjoying a taste of summer up here in Ontario. Still some rainy and cool days though. Have fun on your holidays! We’ll be going to NYC in August. This is such a pretty, summery look! And thanks for the feature, lady! What a fun top, Jess! Though I haven’t worn the trend myself I always appreciate it on others. It really suits you and looks great with your white denim. Love those sandals, too! Gosh this looks so fabulous, Jess!! That top just screams summer!! And boy am I ready! Hi Jess! I really LOVE this shirt and the fruit themed stuff. I just got a pineapple shirt and adore it. 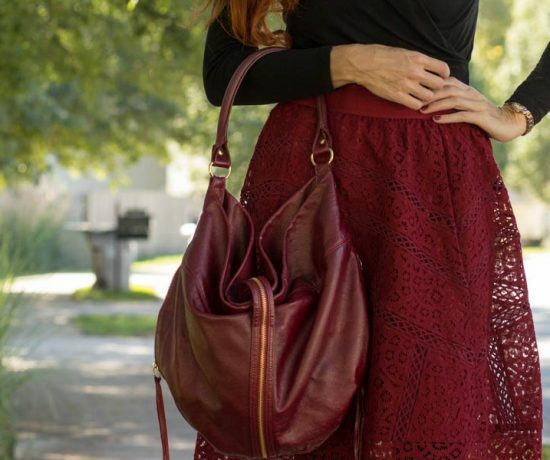 Those shoes are the perfect end to a great outfit! Fabulous in divine fruit print!!! Truly says Summer and happens to be one of my favs on you to date!! You just shine so pretty my friend!! Jess, I am a big fan of fruity fashions, too! I really love the lemon print on your top. So bright and cheerful and pretty. I have had my eye on a lemon print vintage style dress, but I am afraid the yellow is too bright for my pale, pale skin! Those sandals are so fabulous, too! 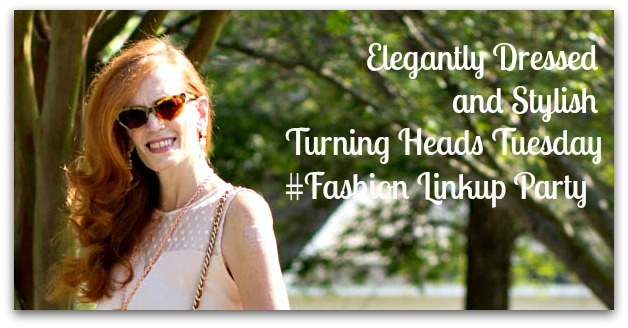 So I think you will enjoy my newest post since you are fellow “girl who wears glasses”! 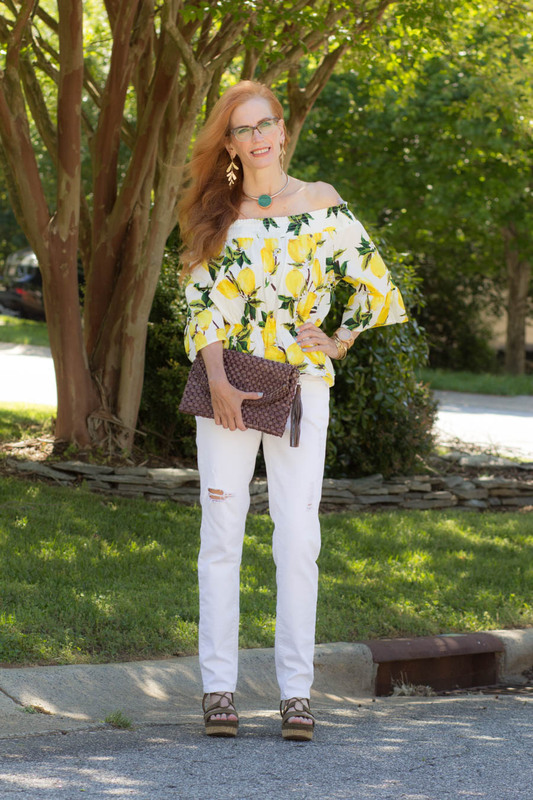 I adore lemon print for summer! Just ordered a lemon top from H&M and I actually have the same lemon print on a different top I also got at SheIn last year. Love this off the shoulder style! Everything about this says summer…so pretty! I love distressed light or white denim – for some reason I am always drawn to crisp cuts with dark jeans and distressed or bleached with pale. 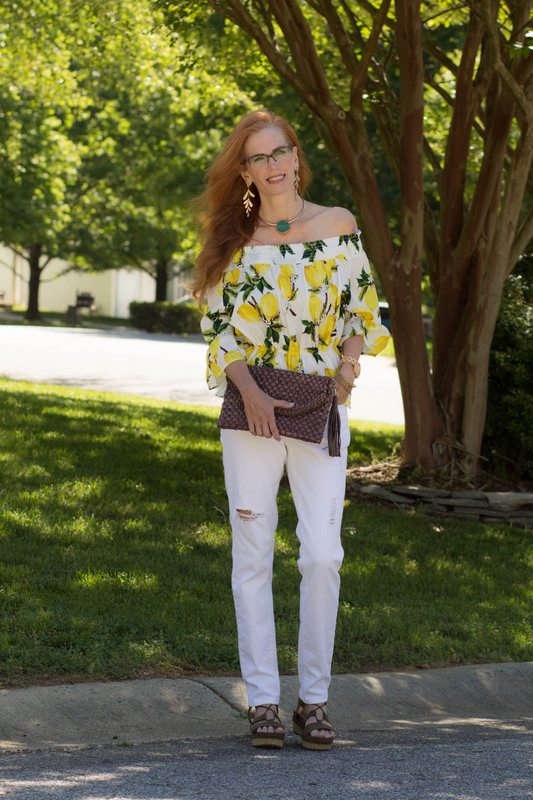 Love this lemon print top , its fun print and off the shoulder style will be just the thing for your warm days. I rather like the brown clutch with your outfit. Enjoy your upcoming holiday, I remember visiting Savannah many moons ago. Fabulous! That top suits you well. And your picks are great, especially the dresses! It s really warm here in the Netherlands! Sunny and warm! Yes, I love it. Enjoy your day.